A CoinNews photos of last year’s 2018-W Proof American Platinum Eagle which personifies "Life"
Last year’s proof Platinum Eagle features a design based on the concept of "Life." It depicts Lady Liberty teaching a small child to sow seeds in a field. Still available, figures through Jan. 27 have its sales at 12,411. For 2019, "Liberty" is depicted. It shows Lady Liberty watching over prairies, lakes, and mountains as pioneers head westward. 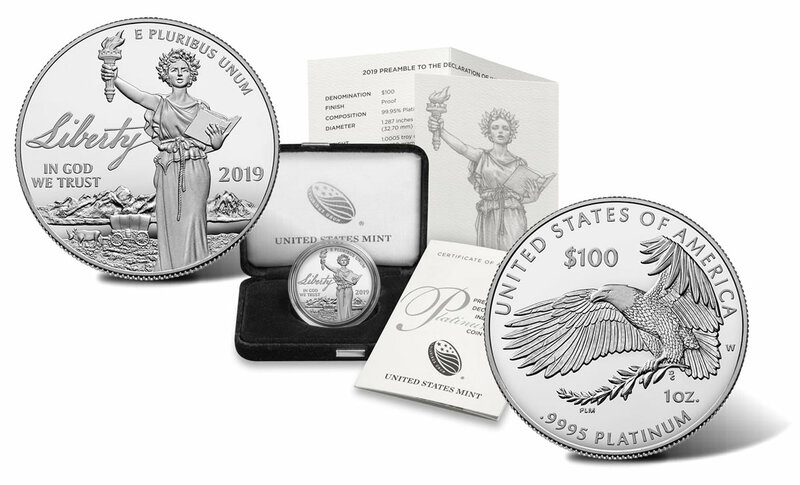 "The wild terrain featured in the background evokes the quintessential American spirit to explore new territory and the freedom to pursue new landscapes, ideas, and ways of life," explains the U.S. Mint. "In the foreground, Lady Liberty’s lips are parted, symbolizing freedom of speech. Her torch is an emblem of the guiding light that liberty provides, while the open book represents the rule of law and its equal application." 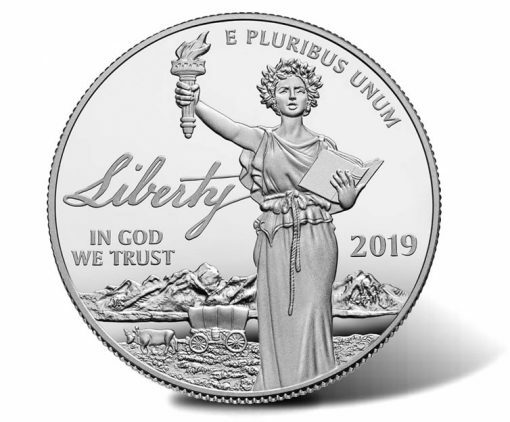 Obverse inscriptions read: "LIBERTY," "IN GOD WE TRUST," "E PLURIBUS UNUM," "2019," "LIBERTY" and the artists’ initials of "JK and "JFM." Reverse inscriptions read: "UNITED STATES OF AMERICA," "1 OZ.," ".9995 PLATINUM," "$100," "W" and the artists’ initials of "PLM" and "DE." The ‘W’ indicates the coin is produced at the U.S. Mint’s facility in West Point. Each coin is encapsulated and packaged in a black velvet satin-lined presentation case accompanied by a Certificate of Authenticity. Great deal! !ONLY $400 over spot……..
Another UGLY coin in a series of recent UGLY platinum and gold offerings. I wouldn’t buy them, even if they were reasonably priced, for investment, and certainly not for their appearance. apparently the mint never got around to putting reins on the oxen so someone in the covered wagon could guide them across indian territory, the liberty ( and life) of whose inhabitants was about to be denied. perhaps its one of those newfangled driverless wagons. LOL. I thought it was the mythical North America Rhino. I thought they were hunted to extinction before anyone could take photos of them. I recall someone commenting that these would “Sell Out” in a few minutes. It’s Friday morning and they are still available. Looks like the flippers were cautious on this one. The collectors all got one. I believe that was the Palladium Reverse Proof coming out this fall. Very low first day sales on this coin! Under 4,000 sold. & last year’s version is still available from the Mint also. LOL !!! Mongo, omg I couldn’t stop laughing. It’s so funny because its true. You know the design is horrid, if even Mongo no like. It’s definitely more than just the price putting people off from buying this coin. 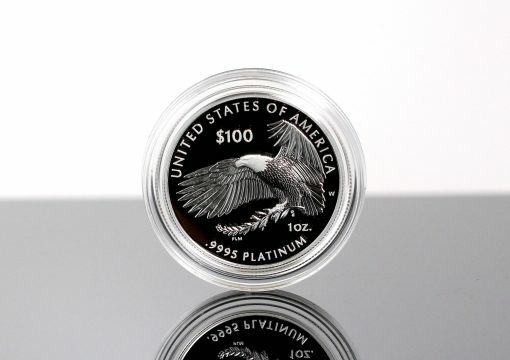 The price of this coin at the US Mint website dropped to $1,170.00.